As will be true for thousands of New Yorkers and city visitors during the summer of 2012, I have spent some delightful hours with the works of artists named Steve at the Delacorte Theatre in Central Park. The 50th anniversary Shakespeare in the Park season honors two Steves in song, in design, in intention, in theme, in philosophy. One Steve — comedian, writer and musician Steve Martin — provides new music to Shakespeare’s poetry, and delightfully animates a sweet summer comedy amidst trees real and imagined that leads to reflections on fathers and daughters, family feuds, gender roles and social conventions. Steve Sondheim provides words and music currently soaring in another real and imagined forest full of laughter and tears, parents and children, hopes and fears. 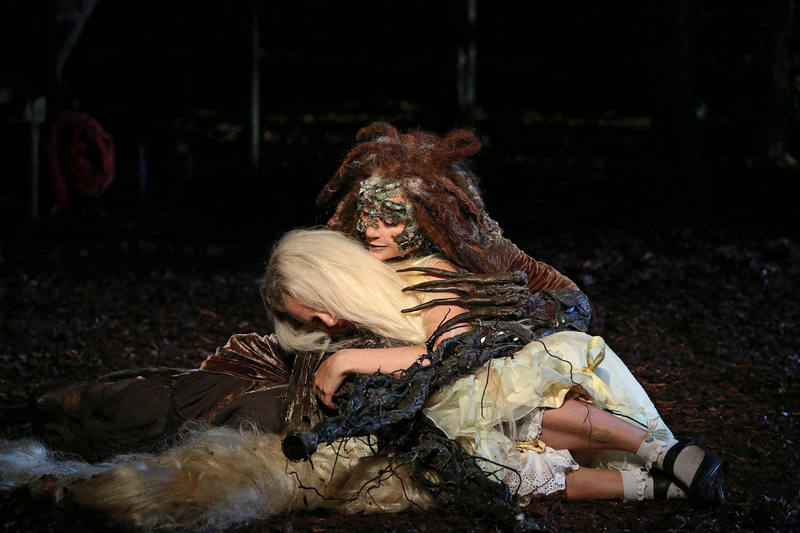 We are reminded in each of these productions that children will listen to the language and lessons around them, and that forests are both comforting and a bit terrifying. At the Public Theatre’s 2012 summer Shakespeare in the Park season the musical Steves rule. Andre Braugher and cast. Image by Joan Marcus. The season’s first production, the playful and melodic As You Like It, opened its first preview on June 5, 2012, and played its final performance June 30. I enjoyed that final performance on a blissfully breezy and temperate Saturday along with a packed Delacorte house of native New Yorkers, tourists and scores of celebrities. Amid the stars in the audience and on stage, Shakespeare’s noble women dressed as men, men acted as oafs, and conventions were cast to the wind in the wilderness. 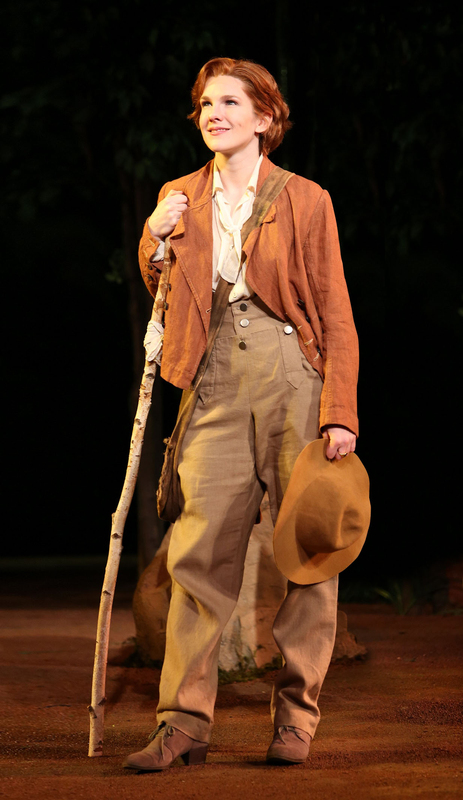 Lily Rabe as Rosalind as Ganymede (as Christopher Strong) and altogether delightful. Image by Joan Marcus. 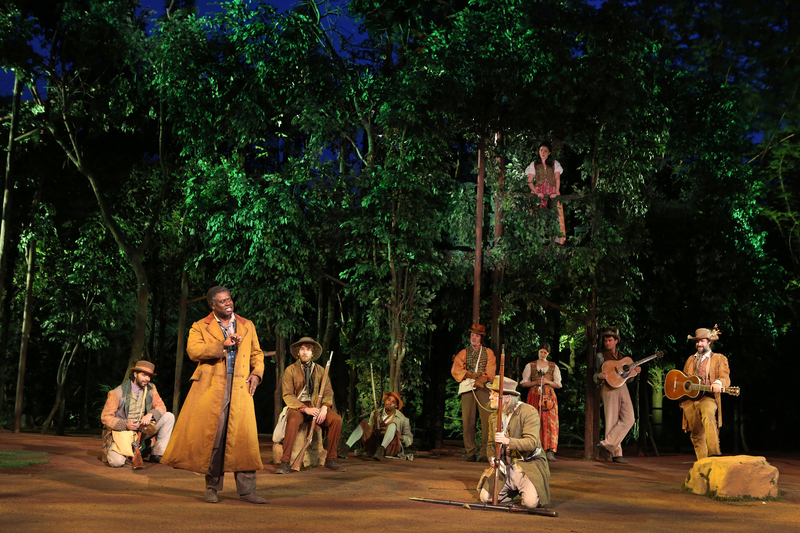 In an early American setting for Shakespeare’s tale featuring the wooden walls of a fort that slid in and out to represent a Shakespearean castle enclosure, set designer John Lee Beatty augmented the live trees encircling the open-air playing space as a living backdrop with stage trees that could hold in their branches military scouts as lookout posts and forest revelers enjoying counter-cultural moments. These trees also provided tree trunks that served as the message board posting location for lovelorn poems written by one character about another. The story is Shakespeare’s, some of my favorite costuming was Hepburn-as-Christopher-Strong meets frontier (exquisitely crafted by Jane Greenwood), and the music was quintessentially American yet delightfully universal as played by the forest-dwelling social exiles featuring a Bluegrass sensibility and a prominent banjo instrumental line. Steve Martin crafted these enchanting, integrated, enveloping musical interludes. The brilliant actor, playwright, funnyman, musician made his mark. Cast. Image by Joan Marcus. 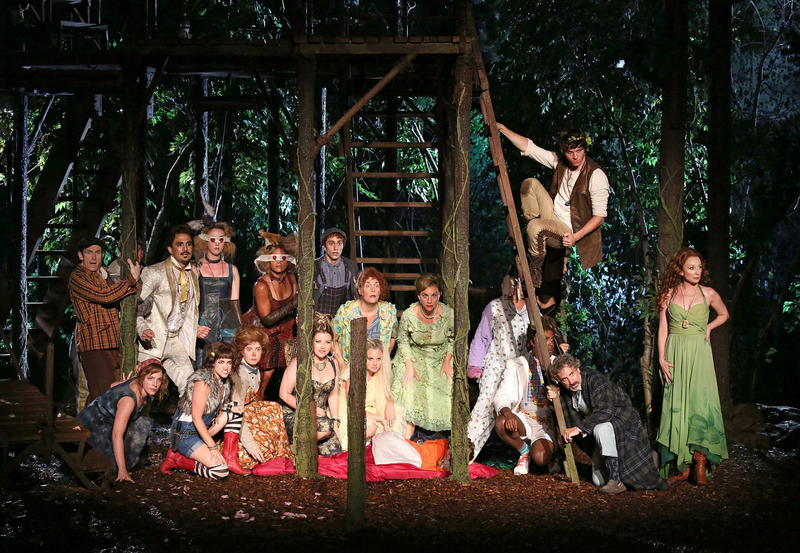 The August run of Into the Woods continues, extended into early September. Stephen Sondheim and James Lapine’s forest story-telling and fairytale re-imagining was indeed scenically served by Beatty’s framing creation (though additional research on the set and puppetry used in this production shows me that it imports the set and puppetry designers from a 2010 Regents Park London production and Beatty is hardly the sole or perhaps even primary man to credit for the set). Among the park trees that frame the Delacorte stage, we experience a world in which the trees of the woods emerge, disappear, morph and grow (emotionally and in reality) to frame the stories of a Baker and his Wife, a Witch and her daughter, Jack and his mother and his cow. (L-R) Tess Soltau and Donna Murphy. Image by Joan Marcus. We feel our way through yearning for children, yearning for connection, facing our fears, and the importance of banding together against the unknown. And our eleven o’clock number reminds us that we must choose words and lessons carefully as “children will listen.” And for me the purest most resonant moment of this rock opera treatment of Sondheim’s score is the tune I often overlook among the gems, the cry of the heart of a sacrificing angry needy yet loving mother — “Stay With Me” as sung by Donna Murphy as the Witch pre-transformation to daughter Rapunzel. Sondheim, attuned to the voices of the young himself, founded and has supported Young Playwrights Inc. since 1981 as a resource to young playwrights learning and honing their craft. Inspired by my own established love for working with young people who are finding their voice in theatre, I have been guest artist and dramaturg for several years in this delightful, delicious, enthralling and supportive Manhattan-based program. We return when we feel inspired, we return when we feel welcomed, we return when we feel that we’re of service. I return to Young Playwrights often — as reader of submitted scripts for their various competitions, as dramaturg for various programs and events..
Steves animate this summer in New York City on stages and in classrooms. Sondheim heeds his own observation and creates opportunities for young playwriting students and teachers alike. Careful, he tells us: “Children will listen.” And careful, I would add, you will be inspired. Tagged as: As You Like It, Daniel Sullivan, Delacorte Theater, Into the Woods, James Lapine, Liam Steel, Shakespeare in the Park, Stephen Sondheim, The Public Theater, Timothy Sheader, William Shakespeare, Young Playwrights Inc.